The Cherry Mobile Skyfire 2.0 was introduced into the market a few months ago packing a Quad-Core processor and a relatively decent-sized 5.0” screen. While it doesn’t go as far as equipping itself with the high-end HD 720p screen, it still brings a more than adequate qHD (960×540) IPS display either way – which probably helps it in terms of a more affordable price, better frame rates, and battery life savings. Continuing on that trend, it also has an 8MP camera in the back and 2MP in front – nothing in the realm of crazy but even ends up to be more than what most consumers need. Priced at a more palatable PHP 7,999, we think it’s a great pickup for consumers who want competitive specs for a lot less in price. If that sounds like you, then you should check out our video unboxing as well as more information about the phone just after the jump! 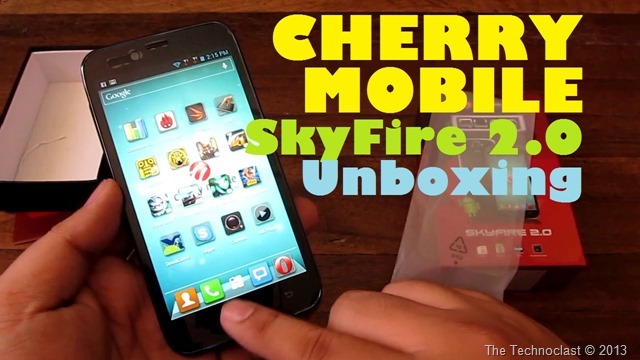 The Cherry Mobile SkyFire 2.0 is available now at the aforementioned PHP 7,999 price tag. Check them out at any Cherry retailer near you!